It was several years ago that I watched an old science video put out by Moody Institute of Science in Chicago, called “Time and Eternity”. It was the first time I had ever been introduced to the sciences that are involved in the study of time and the construct of the period of life we are experiencing now that is temporary, yet designed in eternity. If you have some spare time and want your brain to explode, take about 25 minutes, and watch the video mentioned. I can’t say that I understand it all, nor that I have even scratched the surface of the beginnings of understanding, but there were several things that stood out to me in this video, and one in particular that I wanted to share. At about minute 4:40-5:25 there is an illustration that caught my attention and made me think. 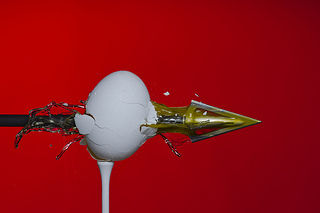 It is the illustration of the arrow being shot through the egg in slow motion. Have you ever witnessed a tragedy, or accident? Do you remember thinking that everything was happening is slow motion? Have you ever received devastating or life-altering news and it feels as though time has stood still, or that your world has come to a stop, while the rest of the world continues on? I’ve experienced it and I’ve heard people say those word. Pain can cause the mind to process the information frame by frame like the slow motion camera. Years after a tragedy, it is not unusual to find that the loved ones left behind are still feeling the effects of the event. Like the arrow through the egg, we only see a split second of trouble. The arrow passes through, there is a huge mess, and the arrow continues on. While I see the momentary event, the victim, or survivor of a tragic situation, lives the rest of their life in the slow-motion of the camera. The shell of the egg is still moving away from it’s center, and yolk is still falling from the sky, and landing on everything. It’s as though it has never resolved or finished. The arrow has moved on, but the effect continues. Put yourself in that scenario for a moment, and consider the illustration. God who sees the end from the beginning has allowed many things to pass through our space of life called time. What are only blips on the screen of eternity, become stories that unfold over lifetimes and generations. I think of the one act of Adam and Eve, who probably said to themselves, “It doesn’t matter if we eat the fruit, heck we are the only ones here. We aren’t hurting anyone else!” That one decision was one blip on the screen of eternity, and for the rest of us, the ensuing consequence of sin is a lifetime of “falling yolks from the sky”. I think of Jesus and his death on the cross over 2000 years ago. His story could be seen as just a few pages in the history books among others crucified, and the affect of his arrow piercing our space of time has turned the world upside down. That grace and mercy is still raining down today. My point in bogging your brain with stories of eggs, is to draw your attention to a God who sees the end from the beginning. Your neighbor may have not seen the arrow that pierced your heart as a child, but God did. While you live in the effect, feeling as though there is no end in sight, you need to know that your pain has an expiration date, and that God who knows you and loves you will see you through the struggle while cleaning up the messes it leaves behind. No matter how quickly time passes, or how slowly your pain prevails, God, who lives in Eternity, will through the context of time is calling you to Himself. He wants you to know that He sees you, He knows you, and He loves you.